Congratulations to Lee Martin who had an impressive season winning the Teams and Pairs competitions. His crowning glory came when he took the Kent Amateur for the very first time. Not only that, he also claimed the Player of the Year award too. A magnificent achievement having been so close on so many occasions, well done Lee! Format: Round Robin, all matches best-of-3. Jimmy got off to a good start by taking the opening frame 51-33. Defending Champion Brandon responded strongly in the second to level the match 55-15. The deciding frame couldn’t have been closer. Jimmy kept his cool, sinking the black to win by 1 point 52-51. Dylan made an impressive start to his campaign by winning the first frame 73-30. More was to follow. George showed his battling qualities before Dylan prevailed 62-29. Brandon’s disappointment in Round 1 was soon forgotten, winning the first frame 49-4. George kept fighting but Brandon was on a roll 73-29. With both players having a win under their respective belts, the clash between Jimmy and Dylan was always going to be pivotal. Jimmy took the lead 42-20. Dylan stepped up through the gears and levelled the match 53-28. The decider was closely contested, each knew it was a massive frame. Jimmy took it 48-39, and in doing so moved into a very strong position. Despite suffering his first loss, Dylan remained composed, focused and determined to beat the reigning champion. Both frames went down to the colours and both times Dylan held his nerve to secure an impressive win 37-31 and 48-40. As the match got underway Jimmy knew victory over George would make him champion. However, George was growing stronger had no intention on making it easy for him. Eventually, Jimmy took the first on the black 66-55. Needing just one more frame, Jimmy didn’t look back. This was his chance and he took it with both hands, racing to the winning line 56-14. Congratulations to Jimmy for winning all of his matches and for becoming Kent U16 Champion for the first time. Dylan, in second place, is also one to watch for the future. We had a full capacity 58 players entered the Kent County Cup with 2 reserves also getting in. There were 11 players from outside the county and with the entry fee now at £15 we were able to offer a winners prize of £400 and £200 for the runner-up. In the top half of the draw Zak Surety was looking very strong but he was nearly halted by Nigel Howe before eventually winning 3-2. He then beat Sean Ward before another 3-2 win, this time over Mark Cackett got him into the semi-final. There he met Matt Howard who had beaten Matt Morgan in the quarters but was not quite at his best today and Zak breezed through to the final. The bottom half of the draw saw last year's winner Dean Galbally make a 124 break, the highest of the day in his match against Ben Trowell. However it was Ben that progressed as he made a crucial 57 break in the deciding frame. He then came up against Steve Crowley in the quarters but Steve was too strong for him this time and won 3-0. Graham Rowe had a good run of wins including a 3-2 quarter final win against Jon Yuen but it came to an end in the semis where he lost 3-0 to Steve. So the final was Zak versus Steve and it turned out to be a great match. Steve took control of the early stages and won the first two frames. Zak then fought back taking the next two frames to level the match. Steve then played a really solid final frame and built a lead and finally got himself in a position to win. He potted a great brown to leave Zak needing a snooker and must have thought he had done enough so he won't want to be reminded of what happened next. He played safe on the blue and we all watched thinking "where's the cue ball going?" as it seemed to roll for ever and fell in the corner pocket. Zak was left with the blue over the middle pocket which he potted and followed it up with the pink and black to pinch victory from the jaws of defeat. We had nine teams at Victoria Snooker club today so we split into three groups of three for the Round Robin stage. Each match consisted of six frames, two for each player with total frames won deciding the positions in the group tables. The group winners qualified for the semi-finals with the next best scoring team taking the fourth spot. 'Chalk Is Cheap' won Group A winning 8 frames and losing 4 with Bexley 'B' finishing 2nd and Stone Street 3rd. Group B saw both Greenhithe Legion and The Committee winning 9 frames and losing 3 with Hartley Boys finishing 3rd. Group C was won by Bexley 'A' just piping The Defenders by one frame with 'Two Beards And A Smoothy' finishing 3rd despite a very nice 75 break from Ben Trowell. The semi-final draw put Roger Knowles, Craig Mahoney and Martin Chamberlain of Greenhithe Legion against Lee Martin, Dan Devlin and Matt Morgan of 'Chalk Is Cheap'. Lee, Dan and Matt quickly took an unassailable 4-0 lead to go through to the final. Meanwhile The Committee (Neil Jefferis, Adrian Frisby and Finlay Palmer) were having a real battle against Spencer Flowers, Alan Bailey and John Meaney, the Bexley 'A' team. It went to 3-3 so a single frame play-off was required and it was Neil and Alan that were nominated respectively by their teams and Neil managed to scrape through. The final however was another one sided affair as The Committee had no answer to the high scoring 'Chalk Is Cheap' players. Dan Devlin, who had made an 88 in his first frame of the day, made a 68 with his first visit and also won his second frame whilst Lee and Matt both won their frames to race to a 4-0 lead and the title. They picked up £120 between them for the win with The Committee receiving £60 for their efforts. Lee's third title of the year means he has now caught Andy Soper in the Player of the Year standings. With just the County Cup to go on March 18th, the title of POTY is now between those two. We had 16 pairs at Welling Snooker Club for our snooker pairs competition. To give everyone a few frames we decided to split into 4 groups and play a round robin. The winner of each group qualified for the semi-finals. Each match was best of 3 frames. The first group to finish all of it's games saw Andy Bartram and reigning Player of the Year Andy Soper qualify, winning all 3 of their matches 2-0. Their opponents in the semi-final were Lee Martin and Phil O'Kane who also won all 3 of their group matches 2-0. Next to reach the semi-finals were Tony Holdstock and Adam Holmes despite losing 2-1 to David Green and David Rimer. Ron Goodwin and Malcolm Smith beat the two Davids 2-0 in the last group match which left the three pairs with 2 wins each but Tony and Adam had won one more frame so they took the semi-final place. Adam had an impressive 92 break in their match against Ron and Malcolm which was the highest break of the day. The last semi-final spot was taken by Keith Matthews and Amrik Cheema with 3 wins in the group stage, two of them going to deciding frames. In their semi-final they continued their good play and took the first frame against Tony and Adam. The Ightham players hit back though to level it and then won the decider to earn their spot in the final. Lee Martin and Phil O'Kane continued their good form beating Andy Bartram and Andy Soper 2-0 in the other semi-final. They then took the first frame in the final too. It was looking good for Tony and Adam in the next though until an untimely miscue with two reds left let Lee and Phil back in. A good long pink from Phil finishing perfect on the black which he duly potted gave them a 2-0 victory and the title and the £120 winners prize without dropping a frame all day. Northdown Snooker Club once again hosted our most prestigious event, The Kent Amateur Championship and this season we decided to bring the event forward from the usual date in February to before Christmas so as to separate our big two events. We were confident this change of date would encourage more players to take part but unfortunately this was not to be as we could only muster a field of 50, eight short of our capacity. Hopefully we shall be back up to a full quota next season. Defending champion Luke Bowry had entered but didn’t show and gave his opponent a walkover and a number of other entrants benefitted in a similar fashion. Last year’s runner up, Mark Cackett was there to demonstrate his mercurial skills on the green baize, he always entertains us with his unique style and he breezed his way through the early rounds barely dropping a frame on the way to the final. Kent Snooker debutant Jon Miles put up a great effort winning three early rounds before succumbing to Mr Cackett. Meanwhile in the lower half of the draw, former winner Matt Howard was in good form as he knocked in a 73 break against Andy Soper to move in to the Quarter Finals, but his race was to end there as he lost 3-2 to long time ambassador of the KCBSA, Lee Martin. However Matt did beat his earlier break with a terrific 86 which was to be the highest of the tournament. In the other Quarter, Phil O’Kane managed to dispatch Steve Wagon 3-1 before he too fell at the determination of Mr Martin with another epic final frame decider. So this set up a final between Lee and Mark and because of the late start, the finalists decided to play best of three. 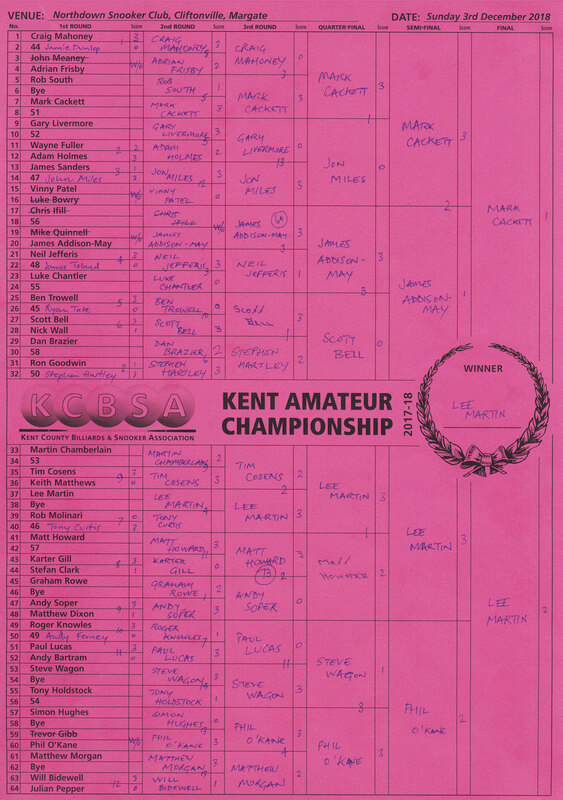 Mark can be a devastating player when he gets on a roll but Lee managed to hang in there and win yet another deciding frame and with it his first ever Kent Amateur title. The day was overshadowed by the event being held up because of a late conclusion to some earlier rounds. The Committee have to take some of the responsibilty for allowing this to happen and we would like to apologise to anyone affected by the competition taking longer than it should, we shall endeavour to make sure the event is concluded at a more respectable hour in the future. Our congratulations to Lee and special thanks must go to Mark who spent a good deal of the day sitting and waiting for many of the longer matches to conclude so he could play again. The Plate competition for the first game losers, ran in parallel to the main event. 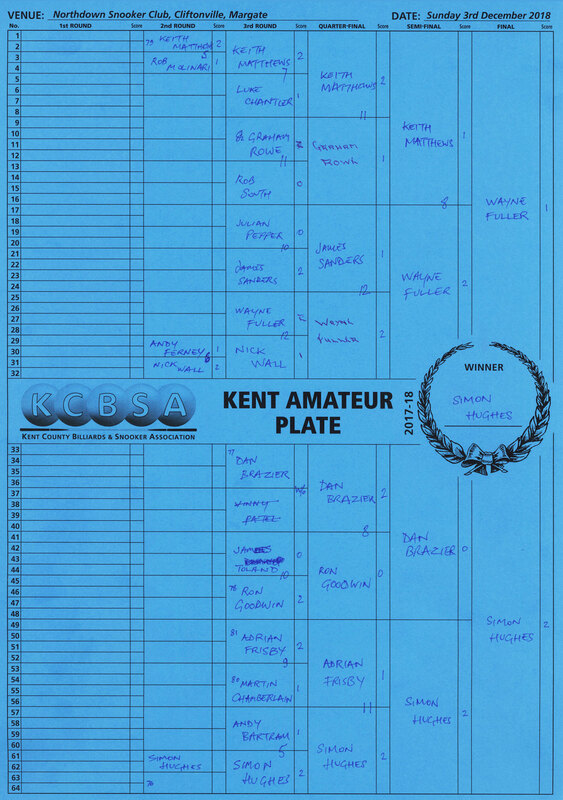 Keith Matthews lost out to Wayne Fuller in the top half semi whilst Simon Hughes managed to topple Plate specialist, Dan Brazier. In a close fought final Simon played commendably to beat Wayne two frames to one and win his first ever singles Kent Snooker event. We had 10 entries this year including 3 new players from Greenhithe RBL club, Roger Knowles, Craig Mahoney and Kevin Kelleher. We split into 2 groups of 5 and the draw put all 3 Greenhithe players in the same group with past champions Leo Hare and Andy Phillips. Each match was played over 45 minutes. Leo scored a total of 554 points over his 4 games, winning 3 of them and only loosing to Andy who won all 4 of his games with a 665 points total. Roger, Craig and Kevin scored 481, 480, and 458 points respectively so the group was very tight but Leo and Andy went through to the semi finals. The second group put Adrian Frisby, Ivan Stevenage, Neil Jefferis, Andy Soper and Trevor Gibb together. Andy Soper managed a total of 562 points but lost his games to both Neil and Adrian who also managed wins over Ivan and Trevor so it was Neil and Adrian who went through. Neil topped the table with 678 points, Andy scored 562, Adrian 382 and Trevor and Ivan scored 305 and 267 respectively. The semi finals and final were played over an hour. Not something you hear very often but Neil scored very quickly against Leo and came out convincing winner 279 to 82. The match between Adrian and Andy however was much closer and as the buzzer went for time Andy was at the table and just 2 points behind. He hadn't hit his shot though so Adrian was the winner 133 to 131. So the final was an all committee affair between the Treasurer and the Secretary of the association. Adrian started well getting an early 20 point lead but it was Neil's day again coming through 212 to 88 in the end and taking the trophy and £100 first prize. Adrian picked up £50 for his efforts. Only two entrants for our Under 21s event but at least that was enough for the competition to go ahead. Reigning champion Ben Sizer would go head-to-head once again with James Addison-May this time in a best of nine. The first frame was a close affair with Ben clearing up with a long blue and pink and a tricky black along the cushion to pinch it. After two dominant frames from Ben he forged ahead to make it three nil. Despite James coming into his own and build a healthy lead, Ben drew on his experience and got himself back into the match with some good match play and a terrific break of 44 to steal it on the black and make it four nil. In the fifth, James knocked in highest break, 32 but once again Ben came back strongly and won the frame and the match on the yellow to see him retain his crown for a fifth successive time and take home £25 for the win plus £10 for the highest break. We really need more entries to this tournament next year. We had a strong field of 16 players including past champions Tony Molineaux, Paul West, Tony Holdstock and the defending champion Alan Bailey. For the first time in the history of the event all matches were contested over the best of five frames. Incredibly the first round saw no fewer than five whitewashes with an early defeat for Alan Bailey against Andy Soper the most notable. The remaining three matches all ended 3-1 including a good win for Ron Goodwin over Tony Holdstock. The quarter-finals started after a short lunch. While Paul West overcame James Toland a battle ensued between Andy Soper and Tony Molineaux. Andy prevailed 3-2. Malcolm Smith forged ahead after his first round victory over Doug Vingoe to beat Clive Underhill 3-1 and so secured his place in the semi-finals. Meanwhile, Chris Ifill played excellently to beat Ron Goodwin 3-1. Ron’s only consolation was a superb 67 break - the highest of the day. The semi-finals got underway around 4pm. Andy Soper seemed to gain momentum and confidently dispatched Paul West 3-0 (the scoreline never telling the full story). The other semi-final saw a closer affair with Chris Ifill and Malcolm Smith - an unstoppable force against an immovable object! Malcolm’s excellent all-round game and steely composure eventually saw him prevail 3-1. Paul and Chris both received £15. The final began shortly after 6pm. It promised to be a close encounter, with Andy, the current Kent Player of the Year against the experienced campaigner Malcolm Smith fighting for the title and £100 first prize. It was truly nip and tuck with honours being shared as each frame passed. Both players brought their best play of the day to the final. After almost four hours of hard match-play snooker Andy Soper took the title 3-2. Malcolm received £50 for his contribution to an exciting final. Thanks go to the Victoria Club for hosting the event and for keeping the candles burning past their usual closing time.